Chert: Mineral information, data and localities. A dense, hard siliceous-rock with low porosity. Cherts are tough, compact rocks with low porosity that are composed mainly of microcrystalline quartz and varying amounts of impurities (Folk et al 1952; Smith 1960). The quartz occurs as randomly interlocked, microscopic quartz grains (microquartz) or fibrous chalcedony (Folk et al 1952; Smith 1960; Oldershaw 1968; Knauth 1994). - Bedded cherts may form by compaction and recrystallization of silica-rich biogenic sediments made of opaline tests of single-cell organisms (diatoms, radiolaria) or remains of silicious sponges, both in marine and in lake environments. 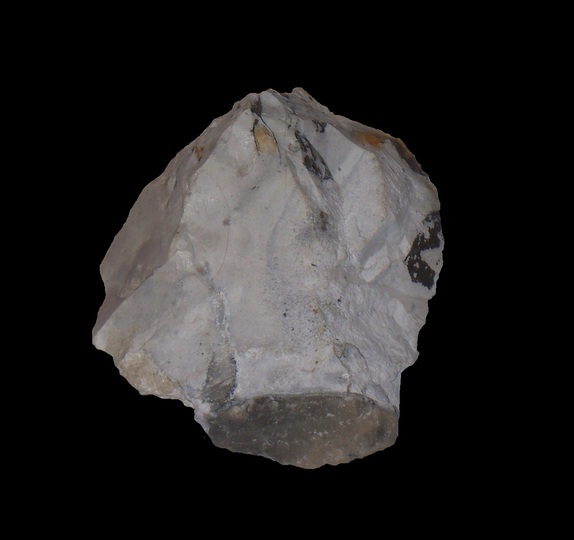 During diagenesis, the silica in the sediments undergoes a transformation from opal-A through opal-CT to microcrystalline quartz in the mature chert (Oldershaw 1968; Calvert 1971; Lancelot 1973; Hein et al 1981; Pisciotto 1981; Riech 1981; Levitan 1983; Jones et al 1986; Compton 1991). Accordingly, these cherts may contain some opal-CT. Silica mobilized from volcaniclastic sediments, hydrothermal solutions and clay minerals may contribute to the silicification (Calvert 1971; Thurston 1972; Pollock 1987; Hesse 1989). 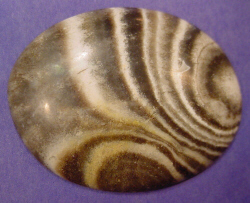 - Cherts in banded iron formations are thought to have formed from primarily chemically precipitated silica. Often they are colored brightly by co-precipitated iron minerals (Sugitani et al 1998; Rosière et al 2000; Maliva et al 2005; Fisher et al 2008). - Some Archean cherts appear to have been formed by silicification of volcaniclastic sediments (Knauth 1994). - Nodules, irregular bodies and discontinuous layers of chert are found in marine calcareous sediments. They typically form during early diagenesis by precipitation of silica mobilized from biogenic sources like radiolarian tests or sponge spicules. (Buurman et al 1971; Meyers 1977; Bustillo et al 1987; Maliva et al 1989; Knauth 1994; Madsen et al 2010). - Magadi-type cherts, named after their occurrence at Lake Magadi, Kenya, form by leaching of alkali ions from silicates in silica-rich evaporites (Hay 1968; Eugster 1969). The term "chert" is occasionally also used for massive rocks made primarily of microcrystalline quartz that deposits around submarine volcanic hydrothermal vents ("black smokers"; Hopkinson et al 1999; Gutzmer et al 2001), or that formed as siliceous sinter, like Rhynie chert (Hesse 1989). 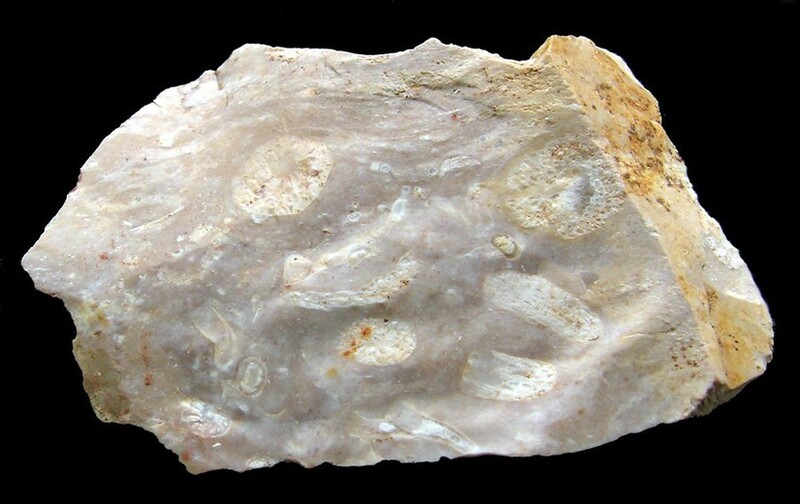 Siliceous precursor rocks of comparable texture that are primarily made of opal-A or opal-CT are sometimes also called chert, but usually with the addition of the dominant silica phase, for example, "opaline chert" (e.g. Weaver et al 1972; Pisciotto 1981, Calvert 1983; Cady et al 1996). Ribbonstone A banded variety of chert. Quartz 26 photos of Chert associated with Quartz on mindat.org. Chalcedony 26 photos of Chert associated with Chalcedony on mindat.org. Tripuhyite 23 photos of Chert associated with Tripuhyite on mindat.org. Parapierrotite 23 photos of Chert associated with Parapierrotite on mindat.org. Hematite 20 photos of Chert associated with Hematite on mindat.org. Arseniosiderite 17 photos of Chert associated with Arseniosiderite on mindat.org. Marcasite 10 photos of Chert associated with Marcasite on mindat.org. Calcite 8 photos of Chert associated with Calcite on mindat.org. Stibnite 7 photos of Chert associated with Stibnite on mindat.org. Goethite 7 photos of Chert associated with Goethite on mindat.org. Folk, R.L., Weaver, C.E. (1952) A study of the texture and composition of chert. American Journal of Science 250, 498-510. Smith, W.E. (1960) The silicious constituents of chert. Geologie en Mijnbouw 39e, 1-8. Hay, R.L. (1968) Chert and its sodium-silicate precursors in sodium-carbonate lakes of East Africa. Contributions to Mineralogy and Petrology 17, 255-274. Oldershaw, A.E. (1968) Electron-microscopic examination of namurian bedded cherts, North Wales (Great Britain). Sedimentology 10, 255-272. Ernst, W.G, Calvert, S.E. (1969) An experimental study of the recrystallization of porcelanite and its bearing on the origin of some bedded cherts. American Journal of Science 267-A, 114-133. Eugster, H.P. (1969) Inorganic bedded cherts from the Magadi area, Kenya. Contributions to Mineralogy and Petrology 22, 1-31. Mizutani, S. (1970) Silica minerals in the early stage of diagenesis. Sedimentology 15, 419-436. Buurman, P., van der Plas, L. (1971) The genesis of Belgian and Dutch flints and cherts. Geologie en Mijnbouw 50, 9-28. Calvert, S.E. (1971) Composition and origin of North Atlantic deep sea cherts. Contributions to Mineralogy and Petrology 33, 273-288. Thurston, D.R. (1972) Studies on bedded cherts. Contributions to Mineralogy and Petrology 36, 329-334. Lancelot, Y. (1973) Chert and Silica Diagenesis in Sediments from the Central Pacific. Deep Sea Drilling Project Reports and Publications 17, 377-405. Meyers, W.J. (1977) Chertification in the Mississippian Lake Valley Formation, Sacramento Mountains, New Mexico. Sedimentology 24, 75-105. Mizutani, S. (1977) Progressive ordering of cristobalitic silica in the early stage of diagenesis. Contributions to Mineralogy and Petrology, 61, 129-140. Hein, J.R., Vallier, T.L, Allan, M.A. (1981) Chert Petrology and Geochemistry, Mid-Pacific Mountains and Hess Rise, Deep Sea Drilling Project Leg 62. Deep Sea Drilling Project Reports and Publications 62, 711-748. Pisciotto, K.A. (1981) Diagenetic trends in the siliceous facies of the Monterey Shale in the Santa Maria region, California. Sedimentology 28, 547-571. Riech, V. (1981) Siliceous sediments from the Nauru basin: Diagenetic alteration of biogenic opal and authigenesis of silica and silicates. Deep Sea Drilling Project Reports and Publications 61, 523-531. Levitan, M.A., Strizhov, V.P., Schevtchenko, A.Y. (1983) Cherts from the Rio Grande Rise Sediments, Deep Sea Drilling Project Leg 72, Hole 516F. Deep Sea Drilling Project Reports and Publications 72, 443-447. Laschet, C. (1984) On the origin of cherts. Facies 10, 257-290. Hesse, R. (1989) Silica Diagenesis: Origin of Inorganic and Replacement Cherts. Earth-Science Reviews 26, 253-284. Bustillo, M.A., Ruiz-Ortiz, P.A. (1987) Chert occurrences in carbonate turbidites: examples from the Upper Jurassic of the Betic Mountains (southern Spain). Sedimentology 34, 611-621. Maliva, R.G., Knoll, A.H., Siever, R. (1989) Secular change in chert distribution: A reflection of evolving biological participation in the silica cycle. Palaios 4, 519-532. Maliva, R.G., Siever, R. (1989) Chertification histories of some Late Mesozoic and Middle Paleozoic platform carbonates. Sedimentology 36, 907-926. Compton, J.S (1991) Origin and diagenesis of clay minerals in the Monterey Formation, Santa Maria Basin area, California. Clay and Clay Minerals 39, 449-466. Knauth, L.P. (1994) Petrogenesis of chert. In: Reviews in Mineralogy, Vol.29, Silica - Physical behavior, geochemistry and materials applications, Mineralogical Society of America. Cady, S.L., Wenk, H.-R., Downing, K.H. (1996) HRTEM of microcrystalline opal in chert and porcelanite from the Monterey Formation, California. American Mineralogist 81, 1380-1395. Sugitani, K., Yamamoto, K., Adachi, M., Kawabe, I., Sugisaki, R. (1998) Archean cherts derived from chemical, biogenic and clastic sedimentation in a shallow restricted basin: examples from the Gorge Creek Group in the Pilbara Block. Sedimentology 45, 1045-1062. Hopkinson, L., Roberts, S., Herrington, R., Wilkinson, J. (1999) The nature of crystalline silica from the TAG submarine hydrothermal mound, 26°N Mid Atlantic Ridge. Contributions to Mineralogy and Petrology 137, 342-350. Rosière, C.A., Chemale Jr., F. (2000) Brazilian iron formations and their geological setting. Revista Brasiliera de Geosciências 30, 274-278. Gutzmer, J., Pack, A., Lüders, V., Wilkinson, J.J., Beukes, N.J., van Niekerk, H.S. (2001) Formation of jasper and andradite during low-temperature hydrothermal seafloor metamorphism, Ongeluk Formation, South Africa. Contributions to Mineralogy and Petrology 142, 27-42. Grenne, T., Slack, J.F. (2003) Bedded jaspers of the Ordovician Løkken ophiolite, Norway: seafloor deposition and diagenetic maturation of hydrothermal plume-derived silica-iron gels. Mineralium Deposita 38, 625-639. Maliva, R.G., Knoll, A.H, Simonson, B.M. (2005) Secular change in the Precambrian silica cycle: Insights from chert petrology. Geological Society of America Bulletin 117, 835-845. Fischer, W.W., Knoll, A.H. (2008) An iron shuttle for deepwater silica in Late Archean and early Paleoproterozoic iron formation. Geological Society of America Bulletin 121, 222-235. Madsen, H.B., Stemmerik, L. (2010) Diagenesis of flint and porcellanite in the Maastrichtian chalk at Stevns Klint, Denmark. Journal of Sedimentary Research 80, 578-588.